We met by sharing the stage during a small (but mighty) production of George M! at St. Pete Little Theatre back in the early 2000s. My favorite memory of Travis was him trying to make us all laugh out loud backstage during performances. He’d have a performance of his own backstage, mocking the conductor of the orchestra out front. With his then-moppy blonde hair, he would bop and fling along with razor-sharp reflexes emphasizing each beat the orchestra plunked out. It was all we could do not to burst out in full guffaw laughter. Each show I performed in with him would include tricks like this – even on stage, which was even more dangerous during scenes that didn’t involve hysterical laughter. Over the years, Travis has continued his love for theatre and has made some significant strides in the professional realm, but there’s so much more to this great human I call friend. A native Floridian, Travis was born in Hialeah and schooled for a brief time in The Keys. His father was the sports editor for The Clearwater Sun. His roots are Cuban as his mother and grandmother both lived there and worked in Ybor City creating beautifully crafted hand-rolled cigars, which is an art form of its own. One thing Travis and I have in common is that we both had an early start in theatre, by creating shows in own front yards for folks to see. Sounds like something the Old Northeast surely loves, especially at Halloween and the holidays! Travis has a love for theatre that runs deep. While an elementary student of Central Pinellas Christian, The Academy of Arts, a touring ministry drama group, came around and performed at his school. At that time, his parents both worked as teachers at CPC, and they all became involved with The Academy of Arts. They even went on a summer tour together as a family, performing and engaging with different communities. 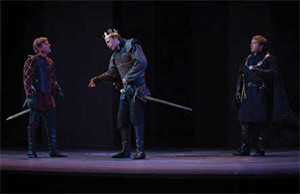 The group’s core belief was that theatre can change hearts in a different way than church could. 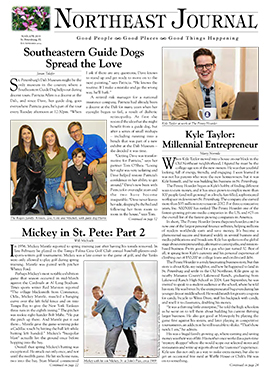 A natural people-person, his enthusiasm for community engagement kept going after college when Travis began an internship at Allstate Insurance, assisting at their new call center in St. Pete. One of his jobs was to set up initial loss claims after Hurricane Andrew hit. At the time, many legislators were visiting the center, and that sparked a keen interest in Travis. In his networking there, he met a legislator who lived in Deland and invited Travis to be his assistant. Travis was fascinated by the power to make real change, and the folks behind it. He moved to Deland and worked as an assistant through the election of ’96-97 when his daughter was born. He felt the urge for a more urban setting and shimmied over to Tampa where he began work as chief aide for a representative in the Florida House of Representatives. He felt a sense of importance, and that he was pulling levers of policy, which he loves. Policy, not politics… figuring out how to create solutions and helping people is where Travis truly shines. Diving deeper into legislative affairs, Travis began working with a large-scale statewide law firm dealing with government affairs. He’d travel to Tallahassee quite often and became interested in the concept of knowing every facet of a problem or issue, thus becoming a valuable resource for legislators to rely on. He eventually broke off to create his own lobbying company, Moore Relations. Today, he primarily focuses on representing community-association interests such as HOA and condominium ownership transitions of debt and estoppal certificates. Travis knows every crevice of information regarding these issues and believes that being trustworthy is the key to this career path. He also works with the Defenders of Wildlife, as well as The Corn Refiners Association where he assists in monitoring GMO and labeling issues across the state. One of his proudest moments professionally was when he worked on the successful passage of Amendment 1 in 2014, which sets in Florida’s constitution a consistent and significant funding source for land conservation so our beautiful and precious resources will be available for generations to come. I’m thoroughly convinced that Travis sleeps in a cannon and is propelled into the day with abounding energy. His love of acting is what led him to his current project, WeSpoke Productions. The name is inspired by fine tailoring ateliers and a nod to the buzz word ‘bespoke.’ The company aligns itself with that definition: finely crafted and one-of-a-kind. While in a production of Tennessee Williams’ The Glass Menagerie, in which he played The Gentleman Caller, Travis found himself with loads of time before he had to go on stage. During that time, he sat still and listened to the words of the play and was incredibly inspired by the language and the emotions it conjured. He began to research Williams. Travis was enthralled with the playwright’s works and what he meant to American Theatre, and he also learned that Williams had lived a rather tragic life. Travis was so affected by Williams that he even attended the Tennessee Williams Literary Festival. 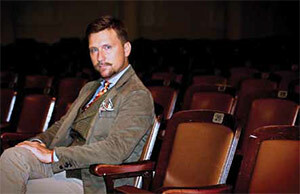 Travis volunteered for three weeks at the Signature Theater in Washington DC (which won the 2009 Tony Award for Best Regional Theatre). He wanted to learn everything about how a theater is run. Knowing full well what it meant to be on stage and performing, he wanted to dive into all the other working parts of what creates theatre. No other person I know – of all my theatre friends and co workers – has done anything like this… to be so passionate about a hobby that you’d volunteer to work in every department of a theater company. For three weeks. Travis also took a class in Producing Essentials at NYU during the summer of 2015. Through networking there, he met his partner, Broadway director Michael Wilson. Michael directed The Incident at Vichey which opened at Off Broadway’s The Signature Theatre in New York City in November 2015. Travis was instrumental in bringing a pre-recorded performance of the show to a live audience at Tampa Theatre last year. Notably, Michael also directed many shows on Broadway including the Tony-Award-winning revival of The Trip to Bountiful. The two of them hit it off and share a mutual fascination for Tennessee Williams. Travis also met visionary playwright and Pulitzer Prize finalist for Drama, Lisa D’Amour, who wrote Airline Highway which premiered on Broadway in 2015. All three of these talented heads are currently working on creating a play inspired by the life of Tennessee Williams and plan to show it here in St. Petersburg. WeSpoke Productions is also beginning to work with American Stage, hosting workshops called 29 Hour Reads which allow Equity actors to work directly with playwrights and directors for 29 hours. They then present a one-time script reading to a live audience. What a great challenge and end result! Working with theaters like American Stage – which focus on fostering new individual creatives and developing new cutting edge works – is a perfect fit for WeSpoke’s anticipated Tennessee Williams piece. Travis fully believes that his job as a producer is to nurture creatives and create a space for them to flourish. Let’s just take a moment here, people. This guy has brought together a Broadway director, a Broadway playwright, and is writing and producing a play on one of the most influential American playwrights of our time. Then, he’s bringing it here. Yup. Sleeps in a cannon. And he lives here! Travis moved to Snell Isle in 2014 and believes that the ONE is the icon of all the legendary neighborhoods here in St. Pete. 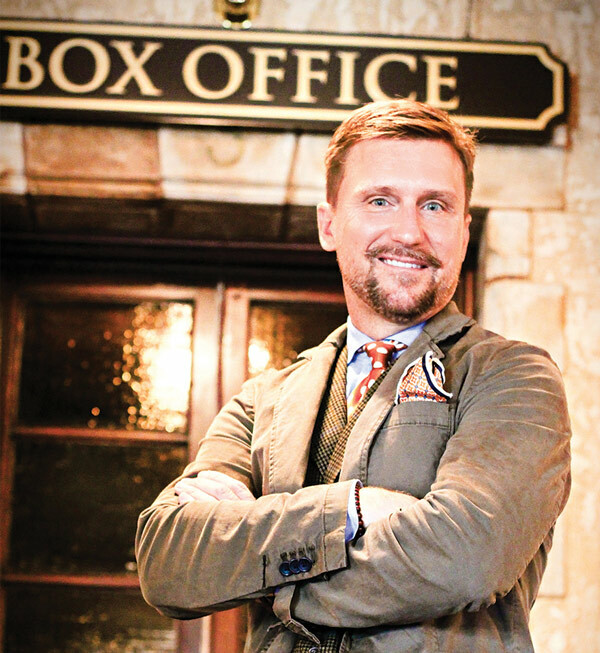 He loves being a part of the downtown renaissance, having an office at the Station House, and being a part of the vibrant community thriving there. He loves the urban setting, walkable communities, and being able to bike or walk most places since it’s such a great way to engage with our setting. Drawn to the water, Travis has almost always lived near it. Born in Hialeah, living in The Keys, and using Florida as the backdrop for his career, the water is a source of renewing energy for him. Also fueling his energy is his gorgeous 17-year-old daughter Savannah, who will graduate from Gibbs PCCA program (Pinellas County Center for the Arts) this coming spring. A talented visual artist, Savannah grew up in the theatre watching her parents perform. She, too, has been inspired by being backstage and has dreams of one day joining the Union as a professional dresser backstage. Travis, you’re my shot of creative espresso, friend. Keep creating, keep plugging, because when we all say “we knew you when…” I’m proud to say I know you now. And now, so does St. Pete.